Buttermilk and spicy yogurt tartar sauce add zing to this southern-fried favorite. Whisk together eggs, buttermilk, and 2 teaspoons Old Bay seasoning in a large bowl. Add catfish pieces. Cover and chill 4 to 24 hours. Remove catfish from buttermilk mixture, discarding buttermilk mixture. Whisk together flour, cornmeal, salt, and remaining 1 teaspoon Old Bay seasoning in a medium bowl. Dredge catfish in flour mixture, shaking off excess. Pour oil to a depth of 1 1/2-inches in a Dutch oven; heat to 360⁰. 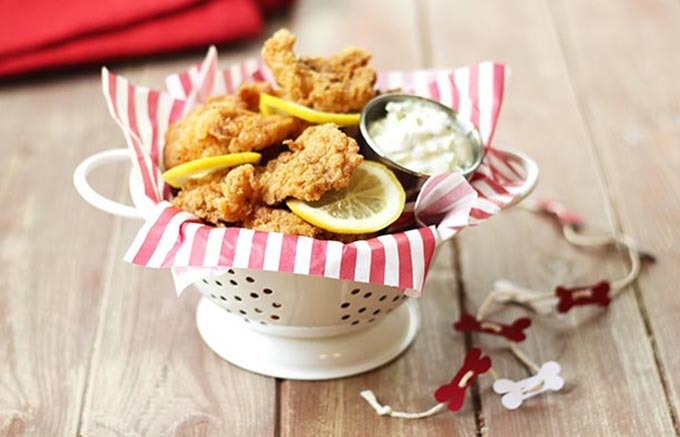 Fry catfish in batches 3 to 4 minutes or until golden brown & the catfish is opaque. Remove from oil and drain on a rack over paper towels. Sprinkle with additional seasoning, if desired. Serve with Spicy Yogurt Tartar Sauce. Mix all ingredients and stir into an even mixture.